Recognizing the contribution of employees leads to a more satisfying company culture. Workers who are acknowledged are more loyal and more productive. This is equally true of volunteers. Awards and public recognition validate their hard work. It tells them that you see and appreciate their contribution of time and effort. It’s the same with volunteer groups who make a point of regular shows of recognition. These groups attract more volunteers, keep them longer and are more effective at reaching their goals. Telling someone you appreciate what she does is nice. Even better is public recognition at a banquet, lunch or simple gathering for coffee and cookies. This gives your employee or volunteer a chance to shine among his peers. It tells him, and the world, that the contribution he is making is important. To boost the power of your verbal appreciation efforts, add an employee or volunteer recognition award. It gives your workers a physical memento of your recognition. They can display in their office or at home, a proud reminder that their accomplishments made a difference. Awards for retirement, reaching quotas, successfully launching a project or meeting a deadline, even showing up faithfully and accomplishing necessary tasks, vary widely. The most important components are durability, practicality, and personalization. If you wracking your brain for something useful that your volunteer or employee would actually want, something you are proud to put your business or group name on, consider the advantages of giving a wooden cutting board. Everyone who cooks uses a cutting board on a regular basis. They are essential for cutting meats, slicing bread, dicing vegetables and coring fruits. Food prep would be impossible without a handy wooden cutting board. And its usefulness is not limited to the kitchen. Hobbyists and do-it-yourselfers use cutting boards to sort, split and cut. They make it possible to use a hobby knife or small saw without damaging the furniture. They are solid enough to withstand hammers and screwdrivers. Wooden cutting boards have enough weight to make them a stable cutting surface. These boards are attractive enough to hang on the wall, which also keeps them out of the way. They add a rustic touch and each one is slightly different. 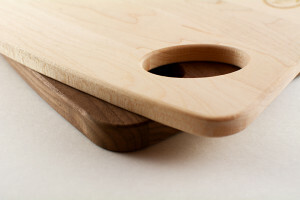 The most common wood species for cutting boards are maple, cherry, and walnut. Each has its own shading and texture. They last for decades with minimal care. Over the years, the volunteer or employee will remember with a smile the day she got the award. An award means so much more to volunteers and employees when it is personalized. You can put your company logo and name, or group name, on the board. Wooden cutting boards can easily be laser engraved and their surface is big enough for all your information. When you buy wooden cutting boards from Wholesale Cutting Boards, you can choose from cherry or maple boards. They come in a range of styles and sizes. Our team of skilled engravers can add whatever you choose to the board. For a custom size or shape, work with our team of designers to produce just the board you want. By buying boards in lots of 25 or more, you can save money and make sure you are never without an in-demand recognition gift. It makes sense to invest in wooden cutting boards as awards for all occasions. Call today for a free, no-obligation quote from Wholesale Cutting Boards. Our helpful customer service team can answer questions and help you choose the best board for your needs. ← Which Is Better: A Wood or Plastic Cutting Board?